We're told to never judge a book by its cover, but it's apparently fine to judge what lies inside Mars by listening to the echoes of meteorite impacts. We know very little about the interior of the Red Planet. We know that once it had a global magnetic field and active volcanoes, but it's unclear if the core is still molten or not. If it is, plate tectonics and earthquakes (which are called marsquakes on Mars) are a possibility. To find out, the next spacecraft to arrive on Mars will come equipped with precise seismometers to detect tremors. The InSight Lander will listen carefully for seismic waves caused by meteorites, and use the data to make some educated guesses at what materials it passed through along the way. The one thing it won't be able to do is work out where the impacts came from - to do this they would need three seismometers in different locations to triangulate the position by seeing how fast the impact sound arrives at each location. Instead, observations from orbiting probes will be used to locate the impact site. 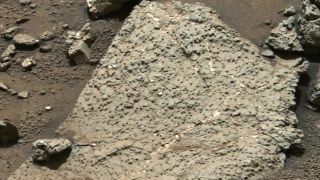 "Impacts do not make very large seismic signals," Nick Teanby at the University of Bristol - who suggested the idea - told New Scientist, "but Mars should be a lot quieter than Earth as there's no wave noise, vegetation noise, or noise from people and cars." The plan was detailed in the journal Icarus. InSight is due to launch in March 2016 and arrive in September of the same year.